It’s been approximately 33 years since Martin Bowes formed Attrition and a heck of a lot of credit has to be given to him for the stamina involved in keeping the project alive. Ambient opener ‘The Unraveller’ provides an introduction that is more in key with previous earlier works, providing a link and contrast between Attrition as they once were and what they’re capable of now, once the break-beat led ‘Karma Mechanic’ kicks in. Bowes’ rasping’s are sliced apart with dual female operatic vocalisations and it’s an effective blend of styles that set Attrition apart as band that has a direction all of its own; providing a duality of production values and individual approach to song construction as a whole. ‘Narcissist’, is up next and was released as a prelude to this album as a digital download EP. 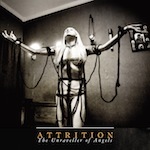 Here we see Attrition fuse a fundamentally EBM bass line with Industrial Rock guitar that fits well with vocals, sliding along the edges of a whisper. The key element to what makes this track differ from so many artists producing music of this ilk, is once again the use of female vocals that stab through speakers along a resurging wave of synth. For long time fans of Attrition there is nothing to fear; Bowes has not relinquished his penchant for the arcane. Episodes that flirt with past output are featured throughout this latest album, once again highlighting a stage of modernity as Martin glues together his vision of old influences infused with a sound more fitting of 2013; ‘Histrionic!’ and ‘Snakepit’ being prime examples of this in action. Overall, there is something for everyone with this latest album. At first glance it would be hard to drag a lot of the younger generation to the fold by this release alone, mainly due to the varying styles that are represented throughout the album; however, Bowes should be proud of ‘…Angels’ as it represents key elements that made Attrition great, whilst having that canny ability to maybe catch the ear of a new audience should they give it a stage. This entry was posted in E-Klageto. Bookmark the permalink.